The simple yet profound message found throughout this unique book is: There will never be peace in the world until people first discover peace within themselves. One of the sad ironies of the 21st Century is that in spite of tremendous progress in science and technology, people still suffer from increasing levels of stress, unhappiness, mental illness, and addictions. What’s the use of wealth if one’s mind is not at peace? Nobody can ever find peace by seeking outside because it lies inside. Only when one stops seeking outside and dives within, can one discover the innermost true Self. Unless one finds this authentic source of peace within, one cannot live a meaningful, contented life. This discovery is the basis of all religions. 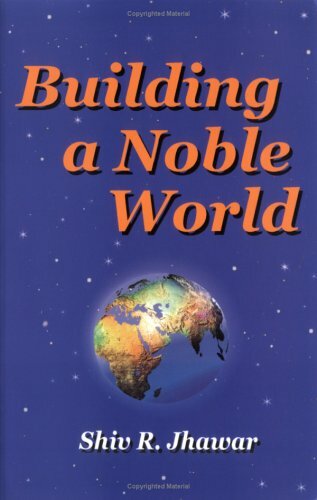 The book, Building a Noble World, is a practical guide for attaining everlasting peace, bliss, and contentment. Modern research continues to prove the powerful effect of meditation on human behavior. Meditation really works! The mind becomes peaceful, stronger, and more energetic through meditation. Meditation is the fourth state of consciousness beyond the mind’s three states of waking, dreaming, and deep sleep. It can transform an individual’s character, conduct, and behavior. Individuals make a family, families make a society, societies make a nation, and nations make the world. Thus, individuals are the world. When individuals change, the world changes. There is no other way to build a noble world. This book shares the essence of all that Christ, Buddha, Mahavira, Krishna, Lao tse, Muhammad, Zoroaster, Moses, Guru Nanak, and others gave. Whenever you’re feeling stressed out, just read this book. It can do wonders to calm your mind and recharge you.